"What if everyone in the Marvel Universe fought everyone in the DC Universe?" If we all had a dollar every time we heard, said or debated the outcome of that little bru-ha-ha, we'd never have to sweat the cost of our monthly pull-lists ever again. 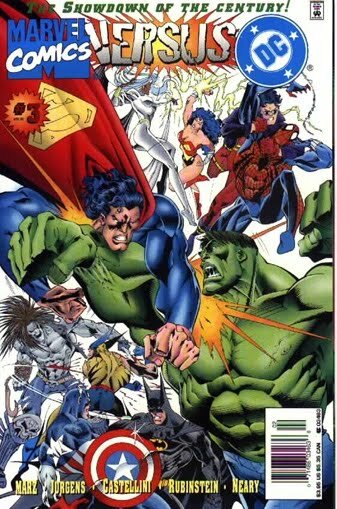 Still when the epic crossover Marvel versus DC finally popped up in the 90's, the long-awaited didn't quite pay off the way many folks expected. But what if all the land lubbers were locked out? What if it was a battle reserved for the stars of the stars? What if it was Marvel Cosmic vs DC Cosmic? Tired of battling through armies of green manga robots Nova flies directly for the Green Lantern, firing a full force nova blast all the way. Just as Richard feels Kyle's forcesheild start to crack, a massive green Wonder Woman lasso's him, twirling him around continuously, before releasing him smack into an Oan moon. "Ya know I always had a thing for Diana" Kyle gloats. "Funny" spits Nova "I prefer women that aren't a figment of my imagination". Switching tack Nova attacks quick'n'close in order to negate Kyle's long range green trinket. "Buddy" responds Rayner, beginning to block and deliver more blows than he receives "Nice thought, but you ain't no Flash... and you sure haven't been trained by Kilowog". High over the charcoaled skies of Apokolips, the Silver Surfer realises Orion's temperament is being held in-check by the machine referred to as 'Mother Box'. Taking it out with a blast of the power cosmic the Surfer wages his level head will now see him victorious. Unrestrained, Orion instinctively leaps onto the Silver Surfer's board. Pitting strength against his unchained primal nature, he then forces his grappling adversary to drive them right at the fiery planet, at full speed. Stepping from the resulting crater, with the unconscious Surfer over his back, Orion spies the Parademon scouts of his father circling in the sky, clenches his fists and smiles - ready for round two. Forces of creation collide as the Anti-Monitor absorbs the energies of the universe, releasing a massive blast which sends Galactus reeling. Before the Anti-Monitor can close in, Galactus's former herald Firelord appears followed by the armadas of a thousand galactic empires. "Your final mistake was choosing to battle me alone" Galatcus boasts. "While we fought, my heralds told the free universe a reprieve from my hunger could only be earned by fighting here at my side". The Anti-Monitor tries quickly to conjure an army of his own but to late, Galactus calmly strides through the armadas onslaught with the siphons of his own ship, attaches them to the Anti-Monitor and turns them on. His vessel absorbing all the energies the Anti-Monitor himself had earlier claimed, and more. Leaving the united armies of the galaxy to finish off his opponents shell, Galactus re-enters his craft, ready to traverse the universe fuelled by his fallen foe. "Happy motoring" Firelord jokes as his master pulls away. What cosmic match-ups would you like to see? The Eternals vs. The New Gods, written "and" drawn by Jack Kirby. Anything 'Kirby' and 'New Gods' gets my wallet opening Rob - actually just anything Kirby does! just so you know Dan i used to have this one shot DC/Marvel cross over in which Galactus comes to Apokolypse to "eat it". 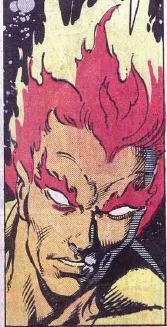 in the during the course of the conflict Orion fought the Silver Surfer. Orion put up a good fight but eventually the Surfer jacked him up pretty good. plus, a show down between Dr. Strange and Dr. Fate would be pretty interesting as well.